"If it's Wednesday, this must be Carlsbad Caverns." If you're a movie buff or of a certain age, you may remember the 1969 romantic comedy directed by Mel Stuart and starring Suzanne Pleshette titled, "If It's Tuesday, This Must Be Belgium." The movie is the tale of a group of tourists blitzing through eight or nine European countries in eighteen days, and a light-hearted jab at the inanity (and insanity) of such tightly-scheduled "vacations." We've been so busy this week -- after a relaxing three weeks at McDowell Park -- that we're starting to feel like we're on a similar whirlwind itinerary that's been planned in advance and must be adhered to because of advanced reservations. Oh, yeah, we DID plan out this week pretty carefully, didn't we?! Of course, today we also modified the plan, as usual. We showed lots of adaptability and endurance today, mostly precipitated (pun intended) by the weather forecast. It is winter, after all. I've been to Carlsbad Caverns twice before and absolutely LOVED the place, but it's been about twenty years since my last visit. Jim's never been here, so I've been itching for him to see it, too. This is my best interior photo at the caverns -- remember it!! 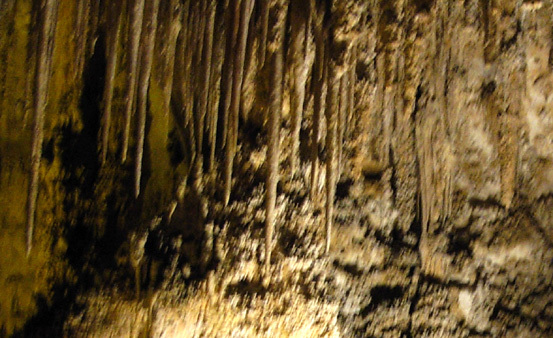 We tried unsuccessfully to visit Carlsbad Caverns during our 2004 Odyssey. That was a strange year of traveling back and forth across the country three times soon after Jim retired. We had sold our house in Montana and were living in our camper for several months until we decided where to "retire." We ended up moving all our belongings to Virginia that spring AND going out West two more times for the Western States and Leadville 100-mile trail runs. We put something like 25,000 miles (maybe more) on the truck in seven months. On our way from McDowell Park in February of 2004 to the Atlanta area to visit friends we tried to see the caverns but we arrived about an hour ahead of an ice storm and the park was uncharacteristically closed. It's normally open every day except Christmas. Bummer! We didn't want to stick around for the ice storm (no camping there anyway) so we tried to beat it by heading east toward Texas. Long story short, it beat us. We hit an icy patch of road on Hwy. 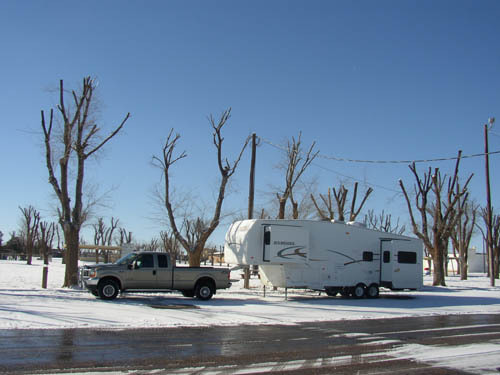 180, nearly wrecked the truck and camper, and ended up spending two (free) nights camping around the square in the friendly little town of Seminole, TX until the ice melted. Let's just say it was a memorable experience. I've been wanting to return to Carlsbad Caverns ever since. This time it worked and the park was open. We beat another ice storm by maybe twelve hours today! (One of the hazards of traveling in the winter, even in the southern part of the country.) Our timing is improving, but not by much. We awoke to a forecast of ice, sleet, snow, and/or rain expected in a wide area of New Mexico and Texas tonight and tomorrow. That prompted our decision to stay only one night at Windmill RV Park. We didn't want to get stuck there for several days. So we checked out of the campground around 8 this morning, taking the camper with us to the caverns. We left it in one of the spacious parking areas while we toured the caverns for a couple hours. I'm not sure if there would be room to park an RV there on a busy day but in January it was no problem. The dogs stayed in the camper. There is a kennel for dogs and cats when it's too hot for them to stay in vehicles. This morning it was in the low 30s and overcast. It was warmer in the caverns than it was outside! They stay a pretty constant 56� F all year long. We drove about ten miles from Hwy. 62 back to the park visitors' center and cavern entrance. It's a scenic ascent to 4,500 feet through hilly Chihuahuan Desert terrain. The flora looked about the same as at McDowell Park in the Sonoran Desert. 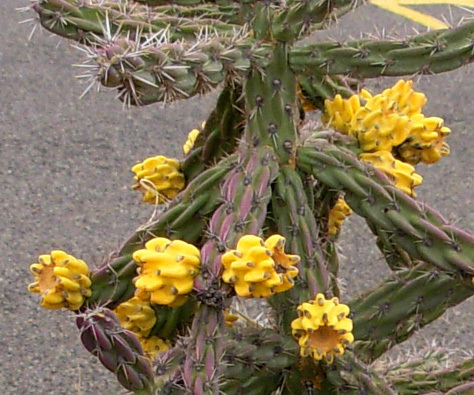 The next photo shows yellow fruit on a Buckhorn Cholla (I think) near the visitors' center. We didn't see that at McDowell when we left two days ago because it's farther north. 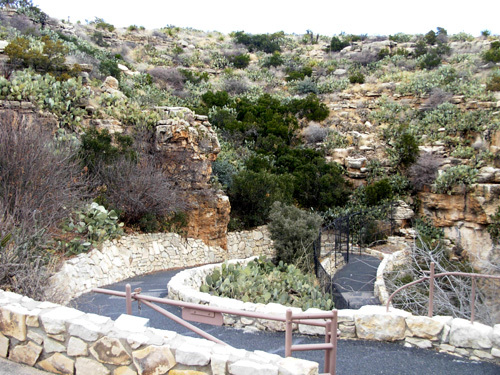 There is also a 9.5-mile one-way scenic loop on Walnut Canyon Desert Drive near the visitors' center. That route was closed today; it's too narrow and twisting for campers anyway. The park has a short nature trail and over fifty miles of primitive backcountry trails. We didn't have time to explore them today so I don't know if they'd be suitable for running. Overnight camping is permitted in the backcountry with a permit. 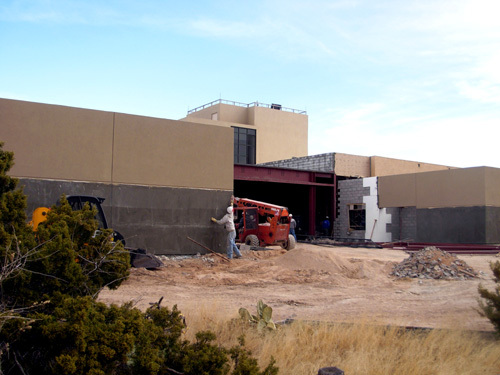 The visitors' center is being completely renovated this winter; it is supposed to reopen by spring or summer. Restrooms, food, tickets, books, and souvenirs are temporarily housed in trailers. I'm sorry we missed all the exhibits depicting the geology, biology, history, and archeology of the caverns and surrounding area but the exhibits should be very nice in a few months..
Carlsbad Caverns is a national park. 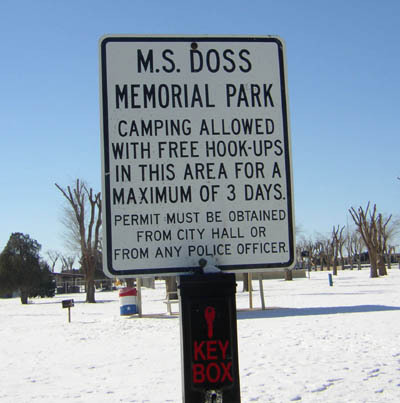 If you have one of the types of park passes, your entry is free. We paid $6 each to enter (good for three days), plus $3 for one audio CD-ROM handset. Jim carried that since he hadn't been inside before. The tape has fifty messages, triggered by electronic signals along the self-guided routes, with explanations of the cave formations, critters that live inside, history of exploring the cavern, etc. It enhanced Jim's experience and when I wasn't busy taking pictures, I sometimes listened in with one ear. (Even with image stabilization and vibration reduction features on my digital camera, most of my photos didn't turn out well in the low light, but I'll include some of the fuzzy ones here to illustrate various points.). If you don't like crowds, this is as good a time of the year to tour the caverns as it is to visit White Sands National Monument. It's not prime vacation season, except for some snow birds. There were several buses of middle school-aged kids in the caverns this morning but they were well-behaved. Most of the other visitors appeared to be middle-aged and older. We had no problems walking at our own pace, taking pictures where we wanted, using the restrooms, etc. Nice! Interesting crevices and holes -- wonder what's behind them?? Speaking of kids . . . it's my strong opinion that EVERY child should see Carlsbad Caverns. And if you're an adult who's never been there, GO. The history and geology are fascinating. If that doesn't appeal to you, consider that it's a total visual delight. 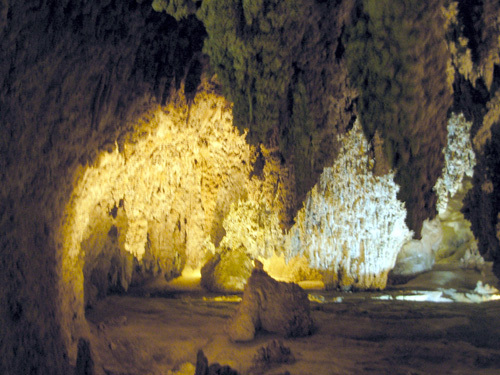 The limestone formations are beautifully lit, enhancing the colors of the iron and other minerals in them. It's easy to use your imagination here. It appealed to my sense of wanderlust and curiosity -- what's through that opening? what's around the next corner?? how did that unusual Lion's Tail form? Lion's Tail -- stalactite and "popcorn"
Carlsbad Cavern isn't the largest, deepest, or most extensive cave in the world but it's the most "decorated" and beautiful. And at over eight acres, it's hard to imagine a much larger cave anywhere. 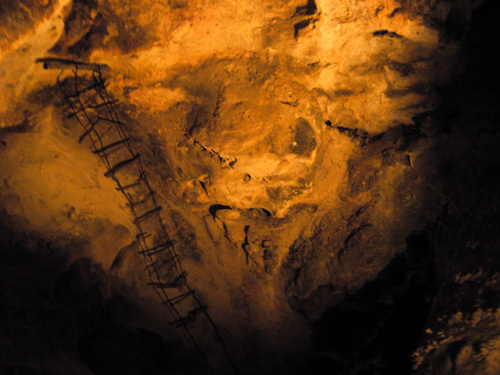 Over thirty miles of subterranean corridors and chambers have been surveyed in the main cavern. 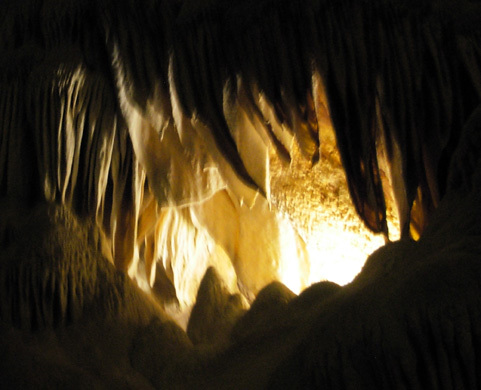 There are 113 caves in the 46,776-acre park. Many have not been fully explored and/or are limited to scientific groups (e.g., the 112-mile long Lechuquilla Cave that was discovered in 1986).. 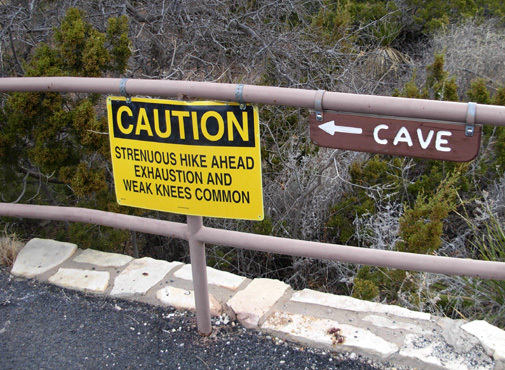 Some can be toured with a guide (Slaughter Canyon Cave, Spider Cave). Even parts of the gigantic main cavern require a guide through their remote or difficult subterranean chambers (King's Palace, Left Hand Tunnel, Lower Cave, Hall of the White Giant). Some of the tours include wearing headlamps, crawling on your belly through tight passages, extra fees, and reservations. There are three main cave tour options, depending on your time, interest, and physical ability. Two are self-guiding; the third is ranger-guided. 1.We took the more strenuous Natural Entrance self-guided route. This 1�-mile trail descends 750 feet on the traditional explorers' route through the tall Main Corridor. It is a steep, narrow, sometimes-wet paved trail that ends at the lunchroom / restroom area underground. Then we walked the Big Room Route for a total distance of 2� miles. No one except rangers can go back UP the Natural Entrance Route, doggone it (seriously, I wanted to walk back up for a better workout since we aren't running today!). We had to return to the surface via the 70-story elevator. 2. If you're short on time or can't manage that type of descent you can do just the Big Room Route. The elevator in the visitors' center carries you 70 stories down to the lunchroom area. 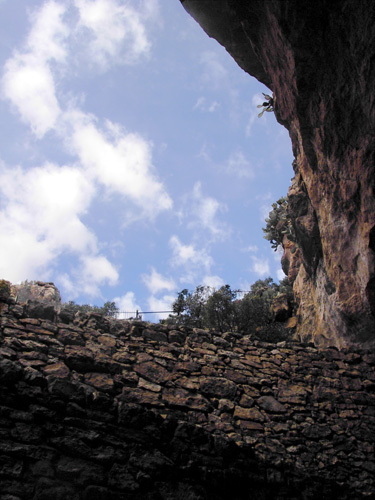 Then you take the less hilly 1�-mile loop around the perimeter of the largest room in the cave. The most level portion of the Big Room Route accommodates wheelchairs. 3. The third option is the 1�-hour ranger-guided tour of Kings Palace. 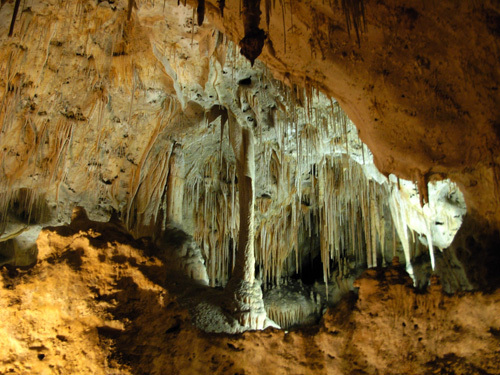 It follows a moderately-easy trail 830 feet below the desert surface, the deepest portion of Carlsbad Caverns, and tours four highly decorated chambers. An additional fee is charged for this tour. I'm sorry we didn't have time for it today. There are several other ranger-guided tours, but this is the most popular one. LIKE A BAT OUT OF . . . I mean, we're going down into the caverns. How bad can that be?? It wasn't for us, even with my Granny Knees. (Be aware, though, that the initial descent to the Bat Cave is very steep. You might get dizzy on all the switchbacks.) Our eyes and brains were more fatigued by the end of the morning than the rest of our bodies. Sensory overload! The Natural Entrance is famous for its bat flights at sunset. Unfortunately, the Mexican (AKA Brazilian) free-tailed bats are wintering in Mexico right now so we couldn't see them or we might have been tempted to stay another night in the area. From early spring until late fall, visitors can enjoy the evening spectacle as hundreds of thousands of the bats emerge from the cave entrance for a night of feasting on insects. At dawn, they return singly and in groups, having gorged on up to half their weight or more in moths and other insects. 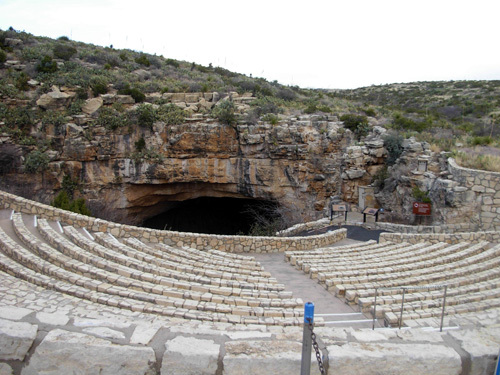 The opening to the caverns was initially discovered, perhaps twelve to fourteen thousand years ago, by Native Americans in the Guadalupe Mountains region who observed the bats emerging during the evenings from March to October. I wonder what they thought of the undulating clouds of bats flying out of that cave! I'm guessing it's a sight to behold the first time you see it. Although there is no evidence the Indians ventured as far into the cave as the "Dark Zone," they did leave pictographs on walls near the entrance. There is an amphitheatre at the entrance for viewing the dramatic swarm as a ranger gives a short talk on bats. 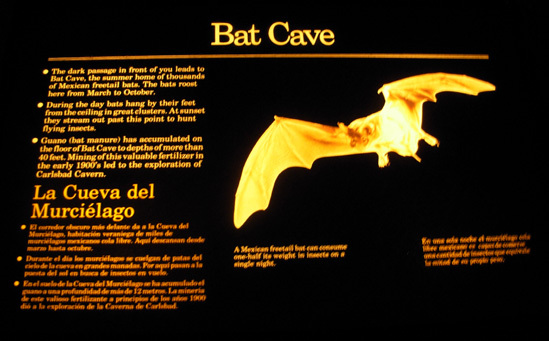 The cavern is a sanctuary for seven types of bats; the Mexican free-tailed bat is the most prevalent at Carlsbad. During the day they crowd together on the ceiling of Bat Cave, a passageway near the natural entrance where visitors aren't permitted. 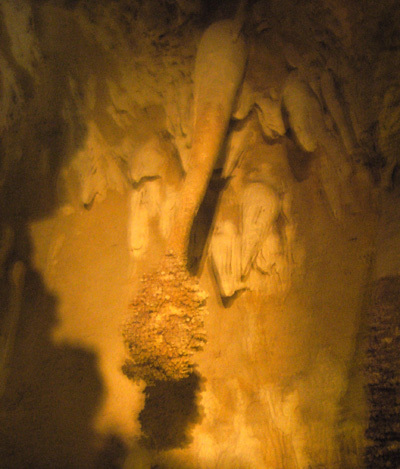 After early white settlers in the area discovered the caverns in the 1800s, some mined the bat guano (droppings) and sold it as a natural fertilizer. I don't know what they do with it now but there's got to be tons of it every season. It was very quiet the farther we descended into the darkness. Visitors are asked to speak in quiet voices so sounds don't echo off the walls and disturb others. We met several young rangers during the descent. Each was eager to answer questions. They are there not only to do that, but also to help protect the fragile formations and pools, provide assistance if someone is in trouble, and enforce the (few) rules. Obviously, the farther you get from the natural light at the entrance, the darker it becomes. Our eyes adjusted to the darkness as we descended and subtle artificial lighting kept the level of light about the same the rest of the way down to the (very bright) lunchroom area. We passed through the "Twilight Zone," the area between the entrance and the "Dark Zone." Some mice, raccoons, ringtails, and snakes seek shelter here but we didn't see any of them. We wished we had a flashlight -- not to see the fairly dark path, but to look more closely at some formations and pools that weren't lit up, and into the numerous nooks and crannies that surrounded us. 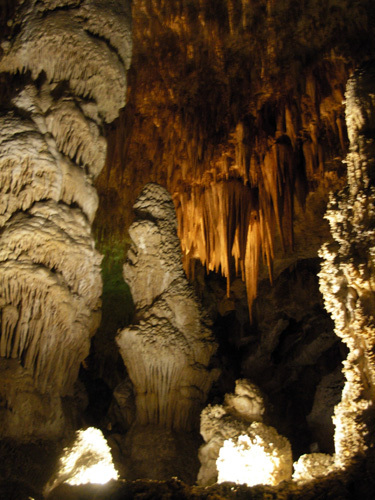 It's permissible to take flashlights into the caverns and they are required on some of the ranger-guided tours. Once we came to the more gradually descending Main Corridor we began to see more and more of the extraordinary features of the caverns, which have been created and decorated drop by drop over hundreds of thousands of years. We passed areas dubbed the Devil's Spring and the Devil's Den (500 feet below the surface), Witches Finger, Iceberg Rock, Green Lake Overlook, and the Boneyard before reaching the trail intersection to the lunchroom and the Big Room Route deep within the earth. The best show is in the Big Room about 750 feet below the surface. The circular one-way 1�-mile route takes you past the most fascinating formations -- soda straws and larger stalactites hanging from the ceiling; columns where stalactites and stalagmites merge in the middle; draperies; flowstone; popcorn; lily pads on the surface of pools of water; cave pearls; and twisted helictites. The formations sometimes "stand alone" and sometimes appear in groups with names like the Hall of Giants, the Chinese Theatre, and Fairy Land. 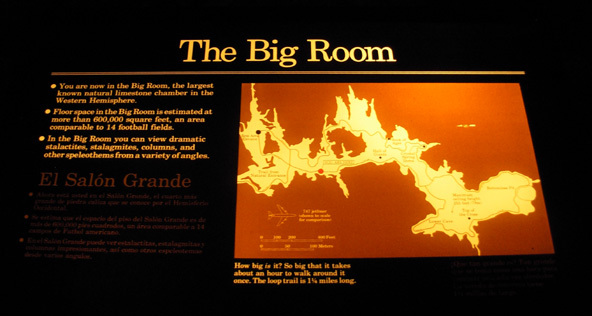 The Big Room, a cross-shaped chamber, really is big at 1,100 feet in one direction and 1,800 feet the other. The highest point in the ceiling is 255 feet. -- and a rope is visible hanging down from it, left from a previous exploration of the room. Remember that inland sea I mentioned yesterday that covered White Sands 250 to 280 million years ago? 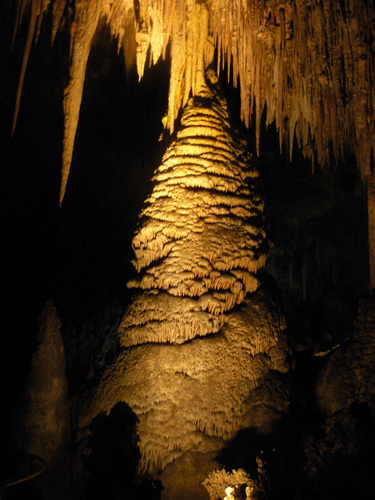 It also covered what is now Carlsbad Caverns. When the sea evaporated, the 400-mile long Capitan Reef was buried under deposits of salts and gypsum for some more millions of years. At the time the Rockies were formed, uplift and erosion also uncovered this Permian-age reef, which is full of fossils that are still being unearthed. Rainwater seeped into cracks and faults in the limestone and mixed with sulfide-rich water from gas and oil fields to the east. The resultant sulfuric acid gradually dissolved the limestone and created the large chambers at Carlsbad that remain today. 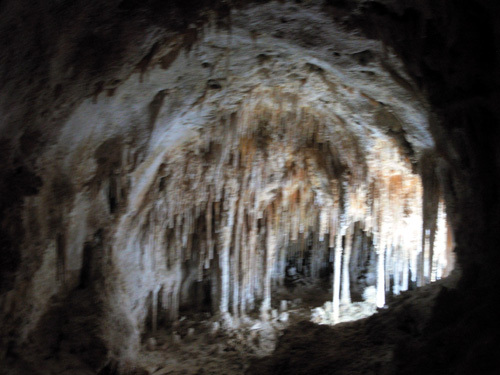 The caves in the Capitan Reef area are unusual in that they were not dissolved by carbonic acid, as most limestone caves in other areas of the country and world were formed. 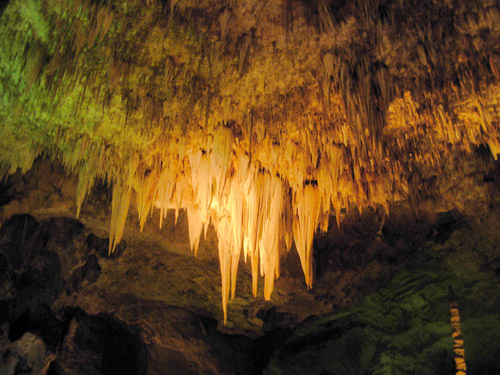 About 300 caves have been found where that horseshoe-shaped reef existed, with over a hundred within the Carlsbad National Park lands and more in nearby Guadalupe National Park..
"The magnificent speleothems (cave formations) that continue to grow and decorate Carlsbad Cavern are due to rain and snowmelt soaking through limestone rock, then eventually dripping into and evaporating in a cave below. Those water drops have absorbed gasses and dissolved minerals from the soil and limestone above. Wherever that water drop evaporates and releases carbon dioxide in an air-filled cave, a small amount of mineral-mostly calcite, is left behind. 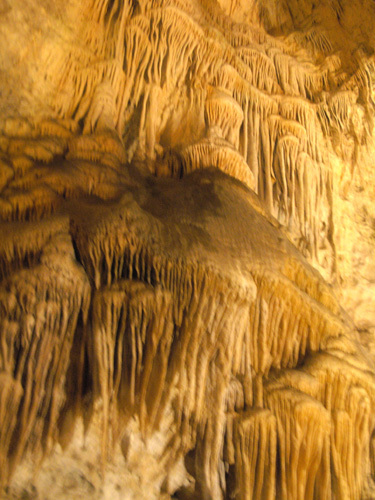 Thus, drip-by-drip, over the past million years or so, Carlsbad Cavern has slowly been decorating itself." "The slowest drips tend to stay on the ceiling long enough to deposit their mineral there. 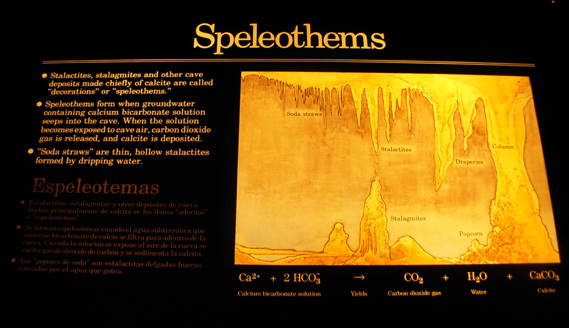 Common speleothems found on the ceiling may be stalactites, soda straws, draperies, ribbons or curtains." "The faster the dripping, the more likely it is to make some type of decoration on the floor. A wide range of decorations on the cave floor include totem poles, flowstone, rim stone dams, lily pads, shelves, cave pools, and of course stalagmites." 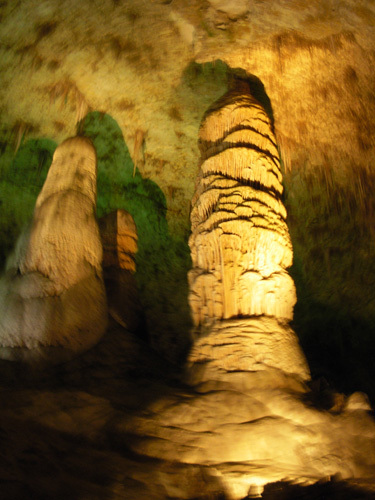 The largest stalagmites in the caverns are the Twin Domes, left, which rise 58 feet above the floor. The largest column is on the right, Giant Dome, 62 feet high. The "floor" beneath them is flowstone. The next photo is of poor quality but it illustrates a point. 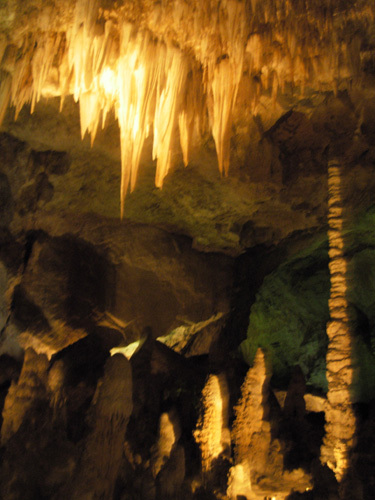 Notice that the two stalactite / stalagmite formations on either side have not quite joined together to make a column but it looks like they will at some point. 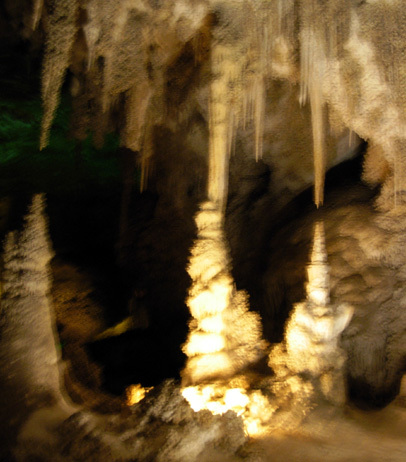 The stalactite and stalagmite in the center have already formed a column. The formations are growing more slowly now that the climate has become more arid than it was millions of years ago, but continual drips of water mean the speleothems are gradually changing shape and new ones are forming all the time. The numerous formations are varied and totally fascinate me. I'm sorry my photos don't do them justice. It's like being in a wonderland, a different world. I felt like a kid at Disney World, ooh-ing and aah-ing my way around the place. By the end of several hours, however, we were about "caved out" and ready for lunch! Lots of sensory overload. We surfaced via the elevator and ate lunch in our camper instead of the subterranean or topside cafeterias. 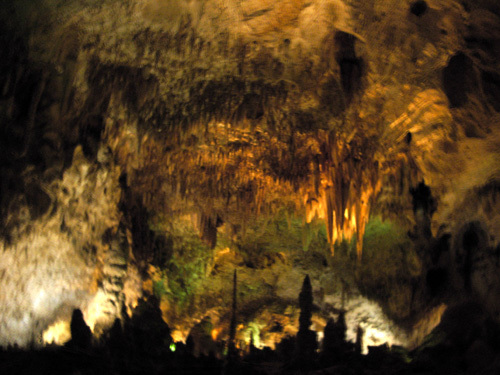 For more photos and information about Carlsbad Caverns, click this link: http://www.nps.gov/cave/ The link for photos is on the left of their home page and includes pictures from areas in the main cavern and other caves that we didn't tour. Here's where our plans once again evolved as we drove south and east toward San Antonio, Texas. We wanted to drive for several hours, find somewhere to stay before it got dark, then finish the rest of the 386-mile trip to Fort Sam Houston on Thursday morning. Our reservations at the campground were to begin on Thursday night, not tonight. When we left Carlsbad just before 1 PM the weather forecast still called for frozen precipitation overnight in the Carlsbad area, and by Thursday night in San Antonio. We had to stay ahead of that storm! We headed south on Hwy. 285 to Pecos, TX. We stopped for fuel at the Flying J at the I-20 exit. We stayed here one night on our way to Arizona a few weeks ago and knew they had a large parking area. It was too early to stop for the night but Jim wanted to check e-mail using the WiFi signal from the motel next door. Jim got into the camper, got on-line for a couple minutes, and tired to close the door side slide-out again. Uh, oh. It wouldn't close properly! Now you can't just drive down the road with a camper's slide-out partially open! We had a problem once with the street-side slide in the living room (first night on the 2005 AT trek!) and Jim was able to fix it. This time one of the two tracks was stuck. He couldn't quickly fix it from underneath but with two of us shoving on it from the outside we managed to get it most of the way in. As long as it didn't wiggle itself out again from vibration while traveling, it should be OK until opened again. Our plan morphed on the spot. This was not a good place for a repair the next day (it was already late afternoon) and we'd probably get delayed by the ice, sleet, or snow that was rapidly approaching if we stayed overnight. If we stopped farther down the road to spend the night, we might not get the slide back in again. We could camp overnight with either of the other two slides closed, but not this one. It's essential for access to the living area. So we decided to push on all the way to San Antonio. Not only would we beat the storm, we'd be in a more permanent location (eight nights) at the military post and Jim would probably be able to make the repair himself. If not, we'd be in a larger city with RV repair shops. Lemme tell ya, it was a long drive -- about nine hours on the road, accounting for the hour we "lost" going from the Mountain to Central Time Zone. Hwy. 285 continued to be good to Ft. Stockton, where we picked up I-10 east to San Antonio. Traffic was relatively light on the freeway through southwestern Texas but surprisingly heavy in the city, even though we arrived after 10 PM. What are all these people doing out here so late on a Wednesday?? We weren't sure we'd be able to get into the Ft. Sam campground a night early. It was too late to call them from Pecos, so we just hoped we could park outside the gate if it was closed or the campground was full. We lucked out in getting the same nice spot that was reserved for us the next seven nights. It was one of only three that were vacant tonight. That was a relief. However, we spent about an hour trying to find the doggone campground because we had conflicting information about which gate on this huge installation to use and the guards at the two gates we approached first had no clue. The web site, military camping guide, and phone conversation when Jim made the reservations didn't jive. We did eventually find out way in the proper, isolated gate -- and duly noted the directions in case we camp there again. Unlike the entrance hassle at White Sands Missile Range, it was a breeze getting into Ft. Sam Houston. We were exhausted and slept well all night!